I have this thing for maps. I need to pace myself from having my whole apartment covered in them. I even have an app on my phone where I keep track of all the different places I’ve visited. But viewing the world from my phone was never enough. Enter: Push Pin Travel Maps. Husband and wife team Mike and Brenda started the company out of Denver, Colorado after searching high and low for the perfect travel pin map with no luck. So, they ended up creating their own. After receiving loads of compliments from family and friends, they knew they had to start sharing their creation with others, so they launched Push Pin Travel Maps. When I discovered I could see my travels on a beautifully crafted map in my living room every day, I didn’t have to think twice. I was in! Now that I have one of my own, I am hooked and convinced that every traveler needs a Push Pin Travel Map. The newest addition to my living room! The obvious perk here is keeping track of your travels. It’s really cool to take a look at all the pins on the map and see all the places you’ve been right in one glance. A closer look triggers those memories of each trip and takes you down nostalgia lane. The amount of map options you have to choose from is impressive. There are world maps, US maps, state maps, and multiple versions and colors of each of those. I went with the earth toned world travel map with the barnwood gray frame! Once you decide on the map you’d like, you can take it one step further by customizing it in a few different ways. They have nine different frame styles to choose from and each map comes with a set of 100 pins in a mixture of red, white, and black, but you can always buy more pins in different colors and styles. In the lower left corner of the map you can choose from one of their personalization options and add a quote to make the map extra special. You can also add a pin legend to identify the meaning of each color pin. I chose Past Travels, Future Travels, and Bucket List for my map. Though I had to pick the destinations I want to travel to most for the bucket list category, because if I’m being honest I want to go everywhere! The customization options are a fantastic way to commemorate your anniversary or display family adventures. As if you needed any more, right? Seeing the places I’ve visited alongside my bucket list destinations keeps me itching for more travel and serves as daily inspiration! Aside from being a unique focal point in your home decor, Push Pin Travel Maps have this special quality where they can spark conversation when you have guests over. 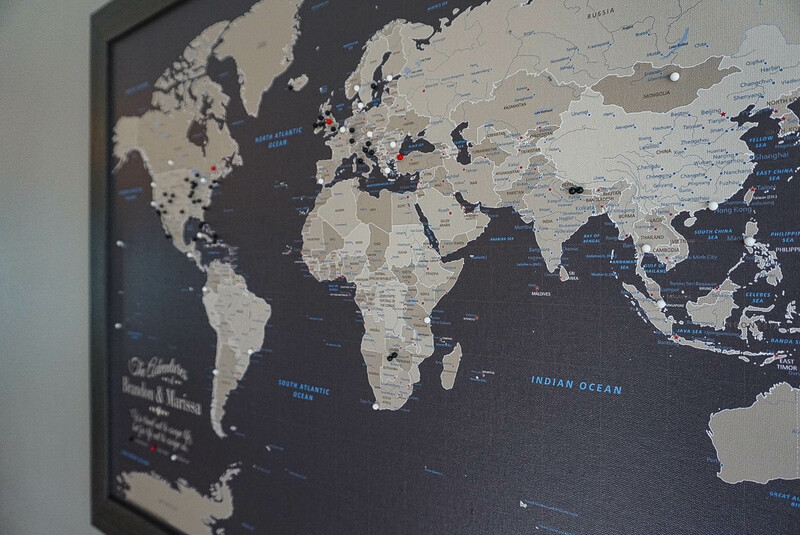 Best of all, Push Pin Travel Maps make for excellent gifts for the traveler in your life. I already loved my map just from seeing it online, but I was even more thrilled to open up that package to find such a high quality map with a hanging kit already installed and ready to be hung! I can’t wait to keep adding more and more pins throughout the years to come. Get yours today just in time for the holiday season! Special thanks to Push Pin Travel Maps for providing me with this map. As always, all opinions are my own. If you have any questions about the companies or products mentioned on this page, please reach out to me and I will happily answer them. There is something really cool about seeing your travels on a physical map. Glad you enjoyed it, and happy travels! What is the app you have for your phone? I can’t find one that does what I want. I don’t have a map app on my phone other than Google Maps for directions, but this physical map tops all the rest!